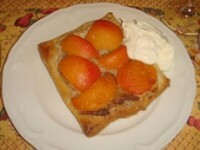 This month, we are cooking with Peaches, Plums, and Apricots. Here is an amazingly simple Recipe that brings out the flavor of any of these fruits. 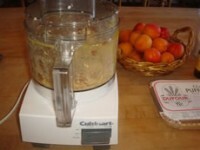 I have adapted it from one published by Anita Chu, founder of the Dessert First blog. Try it, you’ll like it! To make the frangipane filling, put in the container of a food processor, the nuts, sugar, egg, butter, flour, and almond extract. Process until smooth. 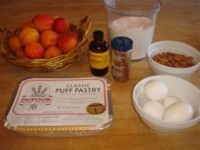 To make the tarts, remove the pastry from its wrapper and lay on a lightly floured surface. Lightly flour the dough and a rolling pin; and roll out the dough — making sure it does not stick to the counter or board — until it is about 3/8 of an inch thick. With a sharp knife, cut the dough into rectangles about 3-1/2 inches by 5-1/2 inches. Lay the rectangles on a baking sheet, preferably covered with parchment paper. 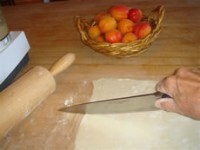 Put a spoonful of the filling on each rectangle of dough and spread with wet fingers to about 1/2 inch from the edges. With a sharp knife cut large slices of fruit to cover the almond filling — called frangipane. Sprinkle the fruit with sugar. 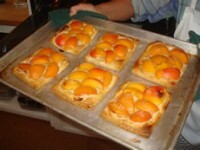 Bake in the preheated oven for about 12 min, until the tarts are golden brown. Note: I like to serve these tarts with mascarpone mixed with heavy cream and sugar.